I don't think there should be any rooms in your house that you just hate going into. I believe your home should be a haven and you should love being in any and all parts of it. I really did not like my master bathroom so I couldn't wait to do something about it. Both bathrooms in our house had carpet in them when we moved in last fall, wall-to-wall carpeting that had been installed in 2000. That was the main reason I dreaded going in there everyday. Old stained carpeting. My vision for the master bathroom was to turn it into a spa-like bathroom...for me! (Mr. H could use the guest bathroom.) This project was done before I joined the world of blogging but I wanted to share it with you because I enjoy the bathroom so much everyday. This is what the bathroom looked like before. I wanted cool colors for a relaxing calm atmosphere. My color preferences were a bluish/greenish "spa" color, white, and gray. Here is what I finally found. This is my first attempt at a mood board (that's what they're called, right?) so bear with me! I did the design but we hired a general contractor for the construction. Here it is all put together! 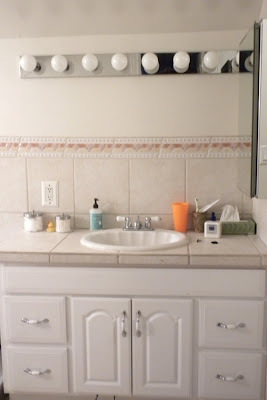 The mirror is not on the mood board because it was custom made for the space. I special ordered the frame from Hobby Lobby and then had the mirror cut at a local glass shop. Since taking these "after" pictures, we have added a box for dried lavender on the wall for a heavenly scent (seen at the top of the post). Mr. H made it for me out of a French wine crate. I love it so much that I made it my very first blog post here. The bathroom is so relaxing and enjoyable now! Oh, what an incredible change. Your bathroom does look so lovely and spa-like. You must be enjoying it immensely. I really like the mosaic border. What a beautiful and tasteful renovation-you have definitely accomplished the spa experience to your bath. The colors are just delightful and it is so tranquil. Nicely done! I'm thinking of doing a gut job in my master bathroom and it seems so overwhelming. However.....seeing the results of your fantastic bathroom, it's given me some major motivation! I can't thank you enough! Beautiful!!! Wow, what a transformation! Your bathroom looks BEAUTIFUL!! 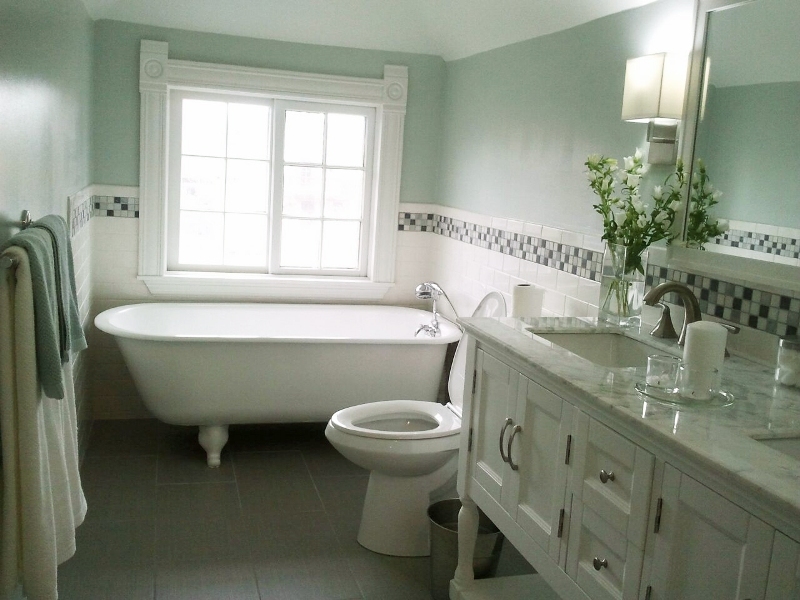 I do love this radical makeover , I see a beautiful bathroom in a soft palette colors, really lovely. I love the tap and every single detail! Well done you! I also enjoyed your previous post, really interesting ! Love the way the bathroom turned out, nice colors, and the old bathtubs are great, glad you kept that. Wow, you created a gorgeous space! I love the vanity, the open bottom makes the room feel larger. What an awesome idea to use a HL frame for your mirror, I wouldn't have ever thought of that! I love the lavender in the wine crate. Your new bathroom is gorgeous!! The tiling is amazing and the paint color is perfect for a spa theme!! So glad you did before and after photos. The difference is amazing! Your bathroom is Amazing!!! I love the bathtub! We have a similar set up in our bathroom except we have a whirlpool tub (which I hate) - I'd love to take it out and get a clawfoot. Your wall color is is so pretty! Thank you for visiting over at my blog! Wow! That is quite a change! It looks fantastic, and your surely got the spa feel you were going for. I love it! Thanks for stopping by my blog. I'll be following you, too! Your bathroom makeover is lovely. I really like the countertops and the wall color. It's very calming and pretty. You did a great job! Well done! It's so calming and picturesque in there. Your flower choice is spot-on. I love your color choices for your blog and your bathroom. While I enjoy a gray/beige/white palate in my home, a light aqua or seafoam green is going to find a space in my house somewhere!!! Thanks so much for your wonderful words about my blog and post, Anita! You don't know how much they mean to me! I also love gray, beige, and white and the idea behind the bathroom was that I would do the more permanent parts (tile, vanity) in those colors and the more changeable part (paint) in the blue/green color. Your bathroom renovation is very beautiful, but best of all I love the lavender in the French box - I would buy that in a heartbeat! Thank you for visiting my blog, and congratulations on your lovely blog; I love your pictures. It's stunning! Love everything about it, especially the cabinet. Great transformation! Thanks for visiting my little blog project and leaving such a sweet comment. Looking forward to "getting to know you". Hi Heather! Thank you for the lovely comment! I truly appreciate it and thanks also for stopping by to visit me! A bit of change with big result. What a difference it has made! I love the soft color you used and that beautiful tile for an accent. Having a mirror made just for the space is a great idea, too. And a box of lavender.....perfect! Since we redid our bathroom....I walk in there just to look around, don't you? Happy weekend! What a change! Definitely very relaxing and so beautiful Khammany!!! Love all the changes you made, great job dear! beautiful makeover. Looks so much better. thank you for stopping by my blog and following! Gorgeous new look, great job! Thank you for visiting me yesterday! I once took a drawing class at night at a community college. Some people have a natural talent when drawing and painting. I had "the desire" to draw. When you have the desire, it takes practice, but eventually the magic happens. The watercolor experience is new for me. That little painting was my first attempt. I was hesitant to post it, but I thought...why not? I encourage you to try if you have the desire. 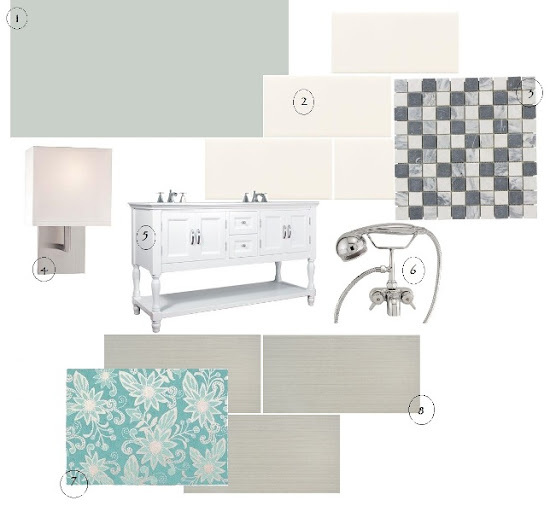 Start playing with the colors of your new bathroom! Play and practice and play! You will find the magic! Do you visit Carol at Paris Breakfasts? She'll inspire you and give you courage! Your bathroom is so beautiful, I would spent hours in the bath reading a book under that great window. The colour you chose is so peaceful. Fantastic job Khammany! I love the box of lavender- I want one! Your bath looks like a beautiful spa! What a beautiful makeover! Thanx for sharing it with us at THT. It is a lovely bathroom! You did an awesome job! love that tub! Absolutely gorgeous! Love the wall color ! I am going to add to my Pinterest board so I will remember it! It's so beautiful!! You guys did an amazing job. It's seriously gorgeous! Your bathroom makeover is remarkable. I just love your vanity. It makes the design work so well. The colors are all so pretty and calming for a good soak in that gorgeous tub. I'm just lovin' it!! Khammany, what a great design eye you have! Your bathroom is gorgeous! 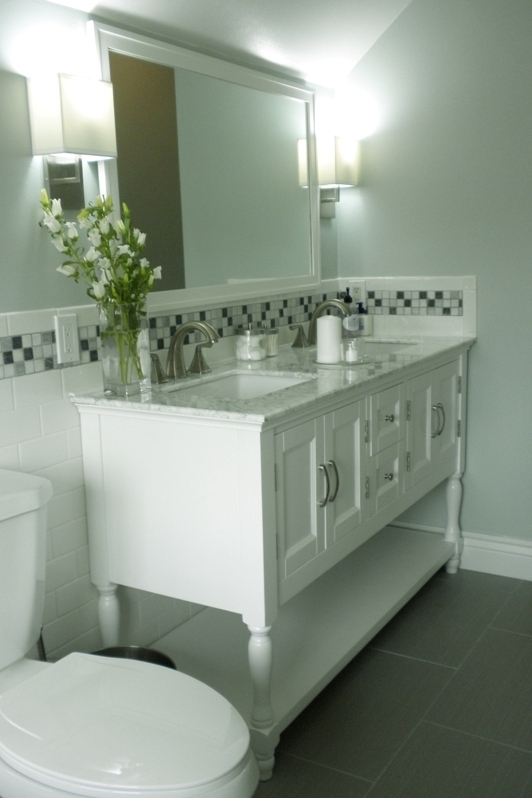 The wainscoting, the tile band around the room, the vanity/ cabinet- I love it all! The wall color is perfect! So glad you kept the tub. Beautiful!! Hi Khammany, Hi, I'm browsing through and stoppd here...so lovely...I really like the wall color! Hi ! we also provide Bathroom renovations services. WOW! You are so talented! The floors wall sconces are gorgeous, but then again, it's all gorgeous! And I love the mood board, too! A stunning design. Thank you for sharing this post. Its really nice and inspirational post you have shared which is attractive and stylish and inspire most of the people to renovate our bathroom. As we are also working with online bathroom wholesaler in Sydney. Whether you want the whole home painted, just interior, exterior, or even just a section of the property, https://dupaint.com.au/ will provide a painting service that adds an extra element of colour and style to your home.